The Apprentice is back. Apparently. Haven’t seen the show in years, but as a recruiter that’s a bit weird. I mean, if I’m not their target market, who is? You have a client, Sir Alan Sugar, who promises a candidate a gig. All you have to do is get through an interview process. Like most recruitment processes, this one takes about three f**king months to finish and degrades everyone involved. I was going to talk through some of the candidates in this year’s show. But since they started showcasing morons, I’ve decided to imagine what would happen if our own well loved characters were interviewing instead. Welcome to… The Bladdy Apprentice. With Sir Alan Bladdy Sugar. 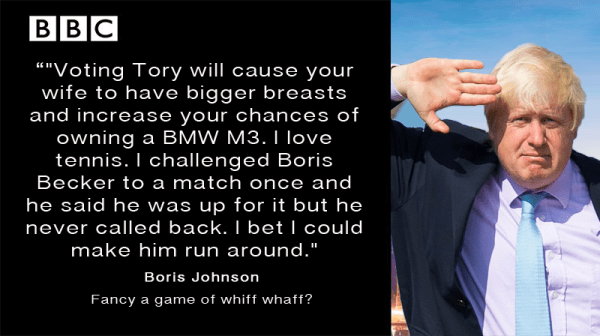 Given the penchant from The Beeb for doing away with credible candidates in favour of bumbling idiots, BoJo would stand a decent chance on The Apprentice. 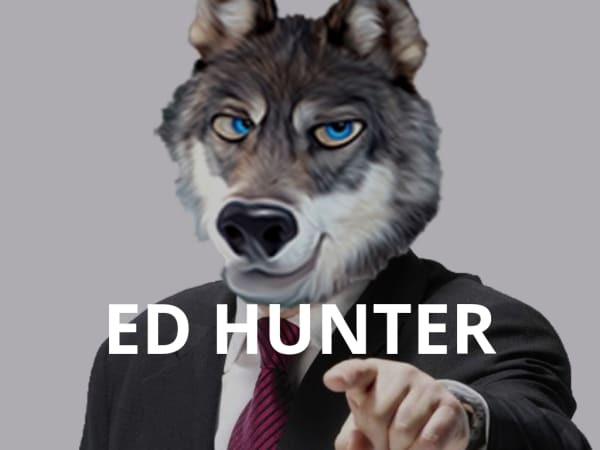 He’d be the underdog from day one, and somehow survive boardroom scraps by bamboozling Sugar and everyone else with long words and upper class chortles. Almost certainly not the episode where they travel abroad for some inexplicable reason. Boris alienates those cut from his own cloth. Anyone from a different social standing, gender, race, religion or planet is bound to be insulted within 2 minutes of the opening credits. 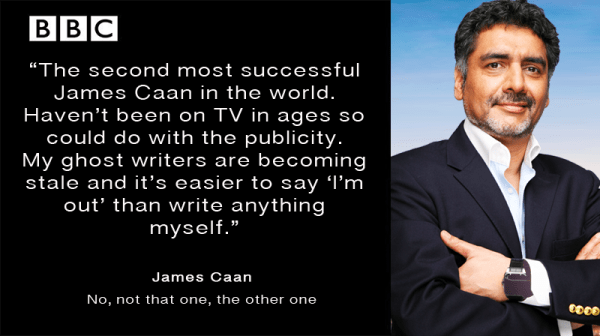 James left Dragon’s Den in 2012 and the nation have been collectively wondering when he’ll be back on our screens. He may well view entrance in to The Apprentice as a step in the wrong direction, but if he’s bored of sitting on his yacht, he might fancy the challenge. Given the fact he changed his name, to be like his favourite actor, I don’t think Claude would take too kindly to his CV in the interview task. Calm down Claude, it’s only a TV show pal. Going on The Apprentice would give Tricky Dicky a chance to raise his global agenda. Namely, reducing the plastic bottles plaguing his daily swims around Necker Island. Of course, the plastic bottles Virgin Cola once produced (RIP) probably contributed to that waste. But you can’t find them for love nor money these days, so he’s done himself proud already. The foreign buying episode would be right up Branson’s street. He made his money from flogging dodgy albums bought tax-free from the continent. And it was that savvy business sense which gave him a platform to produce his other amazing ideas. 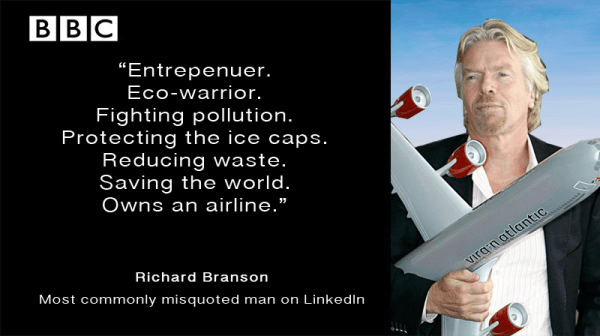 Like suing the NHS and saving the planet with his Airline. Still, at least he pays his taxes these days. Probably. Somewhere. This media darling shot to fame from being on The Apprentice back in the day. And my oh my, what a shitbag. Famed for telling Phil Schofield she finds people who name their kids after places loathsome, her daughter India probably cringed as much as the rest of us. Somehow Katie Hopkins is still on TV. That means she can take a shithouse product no one likes and still make sales. Seemingly the advertising task would be like fish in a barrel. 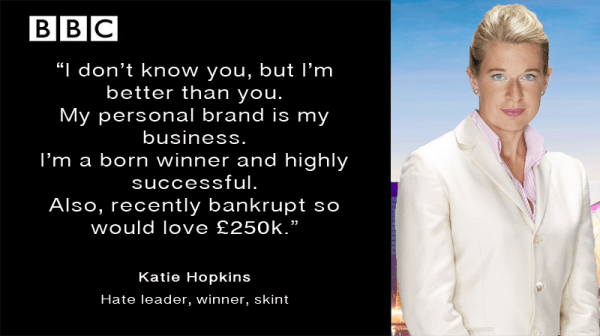 You know for a fact Brigette Hyacinth would win The Apprentice. She’s already won at life, and hands out life lessons like she’s the Messiah reborn. Only, it’s almost certainly not her. It’s a team of ghost writers. Agree? NOW DRINK THE KOOL AID. She’d be Project Manager and give everyone a chance to be heard. She’s won the hearts of LinkedIn and by God she’ll win the hearts of the nation quicker than you can say ONE MILLION FOLLOWERS. Now… stop giving her a hard time! Oleg’s a man whose prowess knows no bounds. He benches more than you weigh and is the fairest man on the planet. I’ve literally no idea how he got a job with The Daily Mail. But once his foot was in the door, he hired every no-hoper known to man. Which to a degree explains the content from his lovely organisation. Would he win The Apprentice? Probably not. But he’d sure teach Sugar a thing or two about HIRING. First lesson: Capitalise at random. WHY? No one knows. Any task he was PM for. I know PM stands for Project Manager on The Apprentice, but it’s surely only a matter of time before Oleg’s Prime Minister. He’d sort that Brexit mess out with COMPASSION. Just don’t tell anyone at The Daily Mail. They’ll be livid. Oh, and for anyone who’s not seen it, this parody by Cassette Boy is well worth a look. The Apprentice is back on Wednesday 3rd October at 9pm. So put “GET OUT THE HOUSE” in your dairies and we’ll bring Thirsty Thursday forward a day.